Expanding the biogas refueling station is necessary for NCT to be able to fuel more natural gas buses and this funding announcement paves the way for NCT to confirm its order for 67 more biogas double decks, representing a total investment by NCT of £20 million. The first of the 67 buses will enter service on Brown Line 17 to Hucknall Road, City Hospital and Bulwell in April, with further routes announced and launched throughout the remainder of the year. It is expected all 120 bio-gas buses will be running by November. 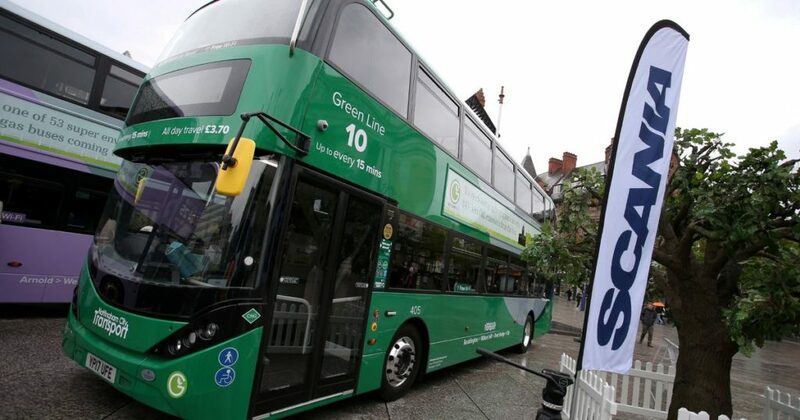 “With 53 biogas double deck buses already successfully operating in Nottingham and making a significant impact on reducing emissions in the city, this announcement for funding to expand our natural gas refueling station paves the way for investment by NCT in a further 67 biogas double decks to join the fleet this year,” said Gary Mason, NCT Engineering Director. With 120, more than half the NCT double deck fleet will be fueled by biogas by the end of the year. “This fleet of 120 biogas double decks, coupled with the retrofitting of exhaust treatment systems to our diesel buses, demonstrates NCT’s support for cleaning up Nottingham’s air, contributing to Nottingham City Council’s overall clean air strategy,” added Mason.